This is what manual labor looks like after working all day to remove burnt fencing (charred in last year’s fires). He drove 90 minutes home looking like that and he plans to return on Thursday to finish the job. Tonight he hits the shower before he hits the sack; tomorrow he drives an hour in a different direction to chop and split firewood. All this for $10-15 an hour. Sometimes I wonder if he regrets dropping out of college. 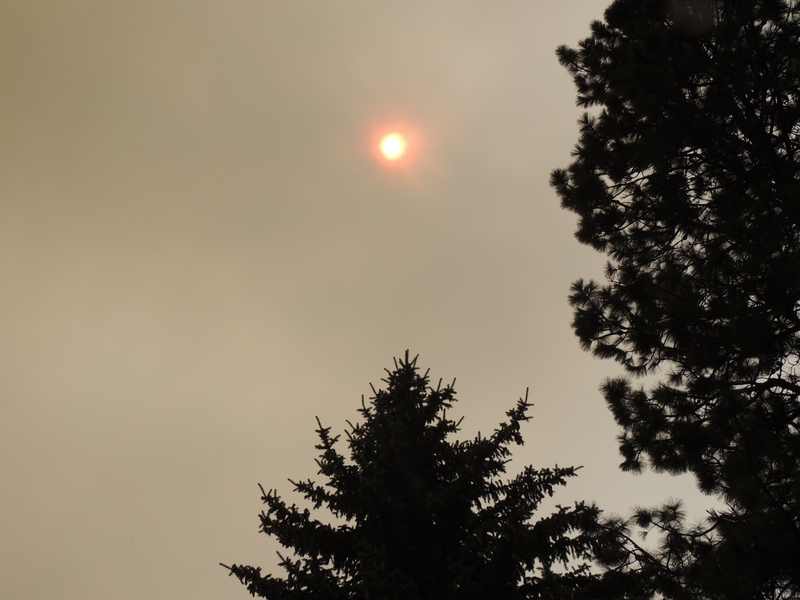 This week we are continuing to be all about wildfires and smoky skies because the Pacific Northwest continues to burn. I need some good book recommendations — nothing graphic, no horror. I am particularly fond of historical fiction and memoirs but I do not limit myself to those genres. What suggestions do you have? The lovebirds and a couple of the mother hen’s friends have been visiting for World Con. Our breakfast table is filled with 6 young adults getting their geek on in the best way possible. I can’t say I understand their language but I do enjoy seeing them happy and communicating with one another. However, that doesn’t explain why my 19yo and 22yo have been watching the one hour long YouTube video of nursery rhymes that has over 800,000 million hits in the past year. This is a scheduled post because I’m hiding out overnight at the lake, where book group was expanded to include an option for a sleepover. I will be back in town for the afternoon farmers’ market; hopefully we won’t have to shut down early again due to dust storms, poor air quality (smoke and dust) and closed roads. I am blessed that my husband seems to understand my need for getaways, even though I’ll miss seeing the cosplay and hearing about the latest happenings at World Con.